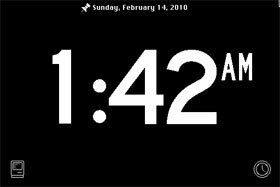 HappyPlusClock is a clock program for Classic Macs with both analog and digital displays. It will run on any model back to the Macintosh Plus, and any version of the Classic Mac OS back to System 4.2. It has been tested with Systems 4.2, 6.0.8, 7.0.1, 7.5.5, and 9.2.2. WARNING: Running any computer will slowly lead to its demise, and that's especially true with the old analog components of a Mac Plus. The clock may be cute, but don't run it 24/7. When you do run it, be aware of the CRT burn-in effect. HappyPlusClock will automatically invert the screen every 12 hours to help even out the burn-in, but there is no remedy. If you use it for something, I'd love it if you e-mailed me at ahall@vitaphone.net. At the moment, the source code isn't available. I'll probably clean it up and make it open someday. If you're interested, contact me. After you start it up, the clock will appear, along with a couple of icons at the bottom of the display. The icons will disappear after a few seconds of inactivity. Move the mouse to bring them back. The date display at the top of the screen can be made to show permanently, or go on and off with the icons at the bottom, by clicking on the little pin icon to the left of the date. HappyPlusClock starts up in full-screen mode if the screen is 640 x 480 or lower, and in a window otherwise. Hold down option at launch to make it do the opposite. 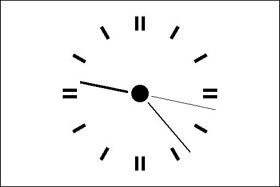 To switch between the analog and digital clocks, click the clock icon in the lower-right corner. To quit, click the Mac icon in the lower-left, or press Cmd-Q. In windowed mode, the File menu is available with a Quit item. To reset the clock, you'll need to set the system time in the Control Panel. The digital clock will respect the system's 12 vs. 24-hour clock display settings. It's not localized for non-English display, though. The clock display switches between white on black and black on white every 12 hours, at 6AM and 6PM. This helps even burn-in, but does not eliminate it. There is no preferences dialog, although for the ResEdit crowd there is a '+PRF' preferences resource in the "HappyPlusClock Preferences" file (stored in the System Folder or the Preferences folder, depending upon the system version). It mainly stores preferences which are set through the user interface (such as whether the date display shows all the time). A few additional settings are not exposed through the user interface. I kept a blog about the development that has a few bits of knowledge gained from hacking on the Classic Mac OS. That's at http://www.vitaphone.net/weblog/geek/hpc/. Fixed crash when opening older preferences file. The '+SRS' resource is no longer used. Display inversion times are now given in the '+PRF' resource, and continue to default to 0600 and 1800. Fixed long-standing and stupid bug causing times from 1200 to 1300 to display incorrectly when system is in 12-hour mode. Removed spurious debugging message from 0.81. Added date display at top of window. I wrote HappyPlusClock in 2007 and 2008, for the Retro Challenge 2007. (I won!) My old development Macs are packed away, and it's unlikely that I'll get back to work on it soon. Maybe someday. When I get around to it, though, I'll release the source under an open license and someone else can pick it up and run with it.